Your astronomy book goes through a detailed derivation of the equation to find the mass of a star in a binary system. But first, it says, you need to derive Kepler's Third Law. Consider two bodies in circular orbits about each other, with masses m1 and m2 and separated by a distance, a. 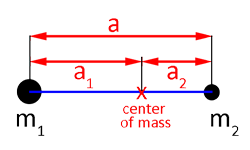 The diagram below, shows the two bodies at their maximum separation. The distance between the center of mass and m1 is a1 and between the center of mass and m2 is a1. 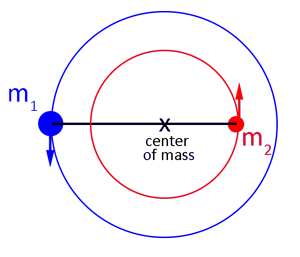 Diagram showing two bodies in circular orbits about their center of mass. The left image shows the two bodies with their full orbits, and the right image shows a detail of the center of mass and the relationship between the measurements of a, a1 and a2. Now, set that aside for a moment and look at the forces working on m2. The forces acting on the mass are the gravitational force and centripetal acceleration from its orbital motion. Canceling, rearranging, and gathering the unknowns to the left side of the equation gives Kepler's Third Law. For a distant binary system, it is be difficult to determine the separation of the two stars in the binary system, a. However, using spectroscopy, it might be possible to find the velocity of one or both of the stars in the system. Now you are ready to use this equation.